Is it a move to remain relevant in the evolving world of big-time college football, or a descent into an “ethical cesspool of misplaced priorities“? A way to ensure a competitive schedule, or a repeat of Army’s disastrous Conference USA run? Navy has made it official: The Mids will join the Big East Conference as a football-only member beginning in 2015. That leaves three full years to argue whether it’s a good idea. Need some ammunition in either direction? You’ve come to the right place. Click below for both sides on some key issues. Point: Big East Commissioner John Marinatto may have been right when he called Navy and his conference “a perfect partnership.” Not only does the Big East (2015 version) offer regional rivals for the Mids (Connecticut, Rutgers), it also includes schools near major naval installations (Central Florida, San Diego State) and a national presence suitable for one of the nation’s service academies. Counterpoint: C-USA had a national profile suitable for a service academy, and Army lasted seven horrible seasons before bailing on the conference concept entirely. And for every trip to sunny San Diego, Navy faithful can expect a nationally televised night game on the unforgiving blue turf of Boise State. Point: As more teams fall into larger conferences, scheduling schools for October and November games — the heart of the conference slate — will become next to impossible for an independent school. The Big East offers the comfort of a conference schedule while preserving the Army, Air Force and Notre Dame rivalries that have been part of the Navy schedule for decades. 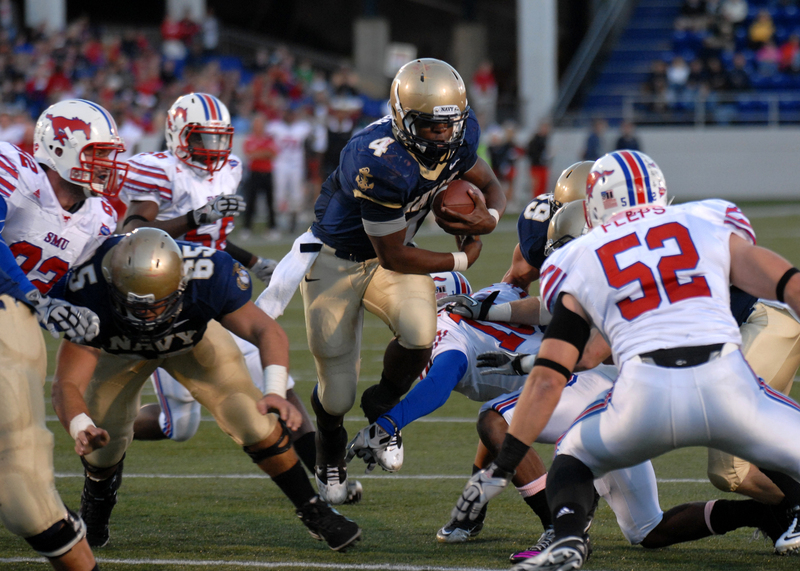 Counterpoint: The Big East schedule could take up eight of Navy’s 12 football weekends. Traditional rivalry games would take up three more. That leaves one weekend a year for the less-than-BCS-caliber competition (the 2012 schedule includes VMI, San Jose State, Central Michigan, Florida Atlantic, Troy and Texas State) that even top-tier programs feast on, albeit early in the year. Navy’s national platform would make it an attractive nonconference matchup to someone, somewhere, at any stage of the season. Point: In college football, TV is king. As Navy Athletic Director Chet Gladchuk put it: “The Big East will assist us in efforts to try to transition … into whatever the network or cable commitment will be.” Only conference ties will give the Mids the national TV presence they need going forward, along with bowl game tie-ins that lend to national exposure. Counterpoint: Navy’s deal with CBS for the Army-Navy game and with the CBS Sports Network for other sporting events would make many college programs salivate. And with the ever-expanding cable universe (and web-based carriers), there’s a good chance you’ll be able to get every college game streamed live directly into your brain stem by 2015. And with the future of the Big East’s TV presence, along with the future of the BCS, still uncertain, it’s unclear what, exactly, Navy’s signed up for. Counterpoint: Niumatalolo also pledged that the program “will not do anything to compromise who we are as the United States Naval Academy.” In 2010, though, spending on the football program was linked to an inspector general’s report on the academy’s “slush fund,” which included this less-than-glamorous statement from an unnamed official: “People don’t come to the academy … because of the ‘world-class faculty,’ they come ‘because we win football games.’” Are there better ways to spend the kind of cash that will be needed to compete in the Big East? That should hold you over at the water cooler for a bit. Remember, we’ve got years to work on this.